The First World War is one of history’s greatest tragedies. 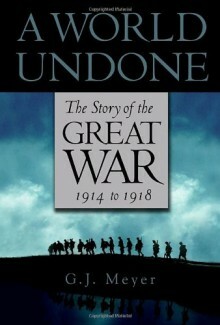 In this remarkable and intimate account, author G. J. Meyer draws on exhaustive research to bring to life the story of how the Great War reduced Europe’s mightiest empires to rubble, killed twenty million people, and cracked the foundations of the world we live in today.The First World War is one of history’s greatest tragedies. In this remarkable and intimate account, author G. J. Meyer draws on exhaustive research to bring to life the story of how the Great War reduced Europe’s mightiest empires to rubble, killed twenty million people, and cracked the foundations of the world we live in today.